"Live everyday as if it were your last." 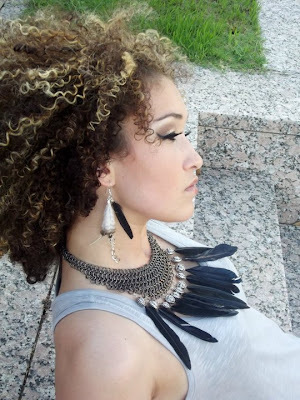 India Lowery Jones King is a member of the Lumbee Tribe from Lumberton, North Carolina. She recently started modeling, and works closely with Turquoise Soul’s Wabanoonkwe Cameron-Hernandez. She has an eclectic style and is an avid supporter of Native artists, jewelers, and fashion designers. She’s a good friend of mine, and she agreed to answer some questions for me. I want to start profiling Native models because many times they are ‘the face’ of Native fashion and they represent an important component of the Native fashion world. Here’s her interview, along with images from a photoshoot that she did for Turquoise Soul’s recent collection, Feather Frenzy. I started modeling recently because I wanted to represent Native Americans with pride and honor. Also, I wanted to show people that Native Americans do indeed have a diverse look. Many people assume that Native Americans all have long dark hair and brown skin. This is a stereotype that is typical because of Hollywood. However, Natives have a range of complexions, hair colors, eye colors, and hair textures. What do you want people to know about Native models like yourself? Native models represent our people not only with beauty on the outside but the inside as well. Most of us are intellectual beings trying to expose who we are to the world. Rather we are teachers, lawyers, professors, or athletes. We all have something we bring to the circle of life. Beautiful is somewhere underneath the glued on eyelashes and layers of makeup. It is the story that we all have to share. The story of who we are, where we came from, and the paths we have chosen. Beautiful is being able to say that we are strong, independent, hard workers of society. Why do you think it’s important for Native models to exist? It's important for Native models to exist because we need to show our future Natives that we are a beautiful people. That we need to come together and show the world how special we are. What is something that a lot of people don’t know, but should know, about Lumbees? That we are the Biggest tribe east of the Mississippi River!!!! Who are your favorite Native designers? Being alive and being able to make others happy is my daily inspiration. Rather it is a friendly smile or a helping hand. The simplest things can change someone's day or life.